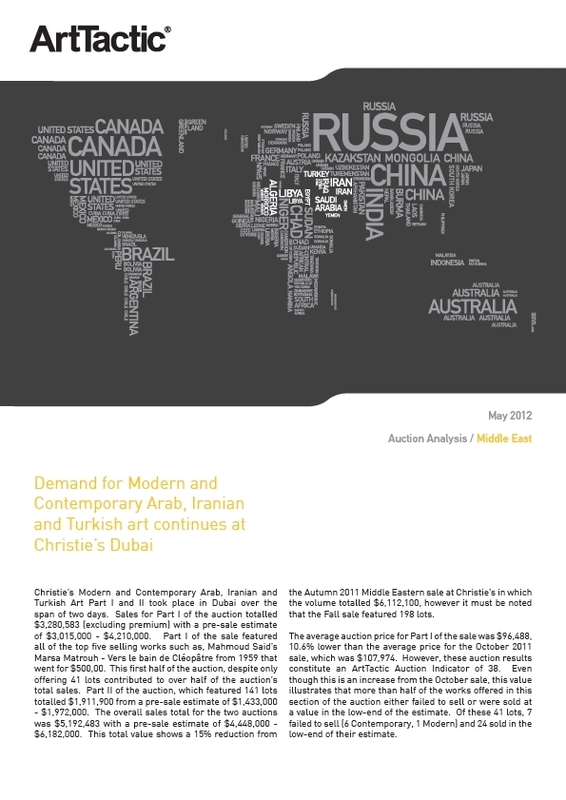 Demand for Modern and Contemporary Arab, Iranian and Turkish art continues at Christie’s Dubai. Christie’s Modern and Contemporary Arab, Iranian and Turkish Art Part I and II took place in Dubai over the span of two days. Sales for Part I of the auction totalled $3,280,583 (excluding premium) with a pre-sale estimate of $3,015,000 – $4,210,000. Part I of the sale featured all of the top five selling works such as, Mahmoud Said’s Marsa Matrouh – Vers le bain de Cléopâtre from 1959 that went for $500,00. This first half of the auction, despite only offering 41 lots contributed to over half of the auction’s total sales. Part II of the auction, which featured 141 lots totalled $1,911,900 from a pre-sale estimate of $1,433,000 – $1,972,000. The overall sales total for the two auctions was $5,192,483 with a pre-sale estimate of $4,448,000 – $6,182,000. This total value shows a 15% reduction from the Autumn 2011 Middle Eastern sale at Christie’s in which the volume totalled $6,112,100, however it must be noted that the Fall sale featured 198 lots.